Future teachers from Ohio’s public universities engage schoolchildren in every corner of the state and have a huge economic impact on the areas they serve, according to a new report from the State University Education Deans (SUED). For the 2016-17 academic year, teacher candidates at state universities were placed in 514 public school districts in all 88 Ohio counties, delivering an economic impact of $92.4 million. The student teachers were represented in 84 towns, 195 suburban districts, 178 rural districts and 47 districts in cities. 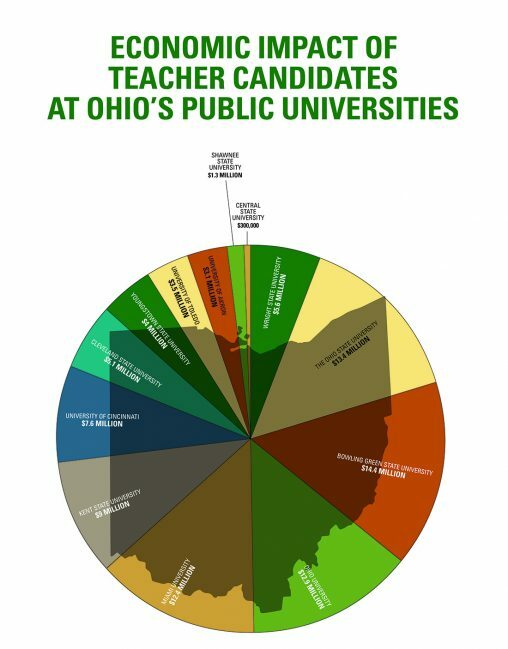 Joseph Keferl, SUED chair and dean of the College of Education and Human Services at Wright State University, said the 2018 report demonstrates the breadth of the teacher candidates’ statewide footprint, their economic impact as they contribute to P–12 schools and the exceptional quality of the Ohio educational programs. The State University Education Deans is an association of deans from Ohio’s 13 public colleges of education. Its mission is to ensure high-quality candidates that are prepared for employment in schools, agencies and other professional settings. “Working with future educators is mutually beneficial as we get to learn and grow from each other,” said Lori Michalec, a teacher in Tallmadge Local Schools and the 2015 Ohio Teacher of the Year. The association works with the Ohio Department of Education, the Ohio Department of Higher Education, Ohio’s private teacher preparation institutions, P–12 school districts and other educational entities, including the Ohio Legislature. “Together with our partners, we will continue to monitor Ohio’s educational landscape and take proactive measures to ensure that every Ohio child has access to high-quality teachers in positive, hopeful, successful schools,” Keferl said. Teacher candidates from Wright State had an economic impact of $5.6 million, according to the association’s report.